Since Exploration and Graph-based views can display an overwhelming amount of information, it is possible to perform focus operations on these views in order to reduce the amount of displayed information to a set of nodes and edges that the user wants to focus his attention on. Focus operations are performed by using the focus toolbar. Selection: Users can focus a view using the selected or unselected elements. It is also possible not to use a selection, in which case, only the dependency types will be modified. Only Visible : If selected, only nodes and edges visible at the time of the focus operation will be considered, otherwise, all the model will be used for the focus operation. The focus button in the focus toolbar offers a dropdown menu with 4 options to perform a quick focus operation. As the image shows, there is one menu entry for each focus mode. 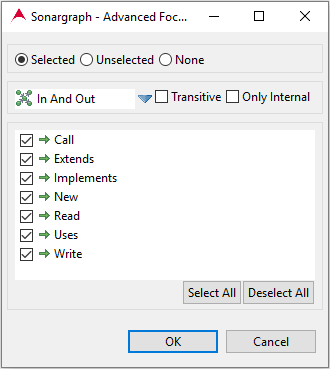 These menu entries can be used to perform quick focus operations which will use the current selection, the current value of the 'Only Visible' button, the focus mode of the menu entry and keeps all the other properties of the current view (dependency types, only internal and transitive). 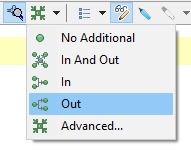 If more configuration is needed to perform a focus operation, users can push directly the focus button in the focus toolbar or use the 'Advanced..' menu entry in the dropdown menu of this same button. Any of these operations will open the 'Advanced Focus' dialog which allows the configuration of all view and focus properties.